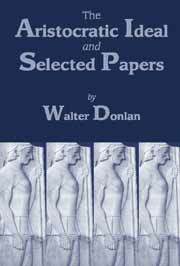 Donlan's 1980 seminal work, The Aristocratic Ideal in Ancient Greece: Attitudes of Superiority from Homer to the End of the Fifth Century B.C., in combination with the reprinting of eight of Donlan's other related works, spanning the years 1970-1994. Approaches to the study of ancient history have changed so considerably in the last generation that it is often difficult to discover works of true durability. One exception to that rule has recently been reprinted: Walter Dolan's The Aristocratic Ideal […]. The study remains, in the words of one 1983 reviewer, "a 'golden treasury.'" Eight selected papers newly reprinted with The Aristocratic Ideal are a fine enrichment of the book. The collection could provide excellent supplementary reading in upper-division courses on Greek history or literature or philosophy […].